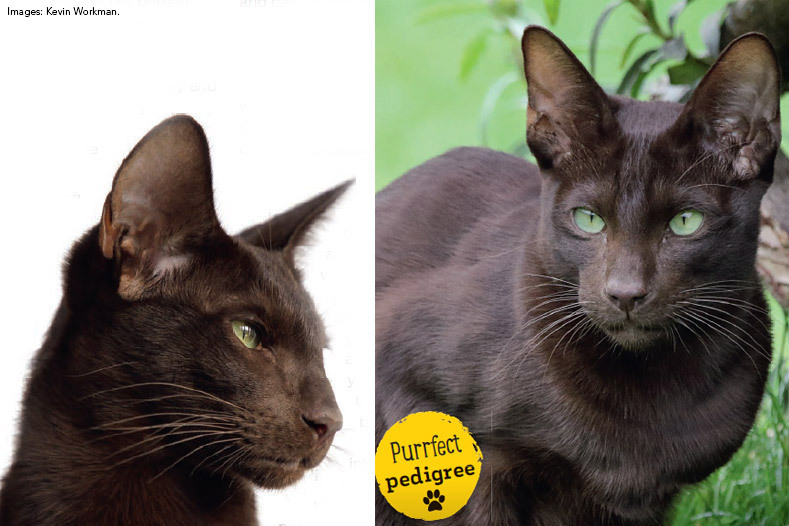 Suffolk Chocolate cat breed information and advice. These cats have already made their mark on cat lovers, thanks to their gregarious, outgoing personalities and beautiful, shiny coats. Suffolks are delightfully chatty cats, but Linda advises that they aren’t for the faint-hearted, as they aren’t the type of cats to just sit around all day. She says: “They very much want you to be part of their lives, and won’t just sit there and look pretty. They’re not timid cats. They make great family pets, and love dogs and children. Suffolks may be demanding of your time, but it’s all for a good reason — Linda says they adore their humans and want to be around them as much as possible: “They will orientate themselves around you. Other breeds of cat might get fed up and scratch you when they’ve had enough, but Suffolks never get tired of attention — if you fussed them 24/7, they’d love it! The breed has been developed over the past decade by Linda and fellow Havana breeder, Pamela Sharp-Popple, in response to the modernisation of the UK Havana. The Havana began life in the 1950s, and was created to be a breed in its own right by a group of breeders, who wanted a self-brown cat of Siamese type. Due to a variety of reasons, the gene pool was split. Some cats were sent to the USA, where they became American Havana Browns. The Havanas which remained in Britain had an insufficient gene pool, and had to be outcrossed to Siamese and other self cats. This eventually created the Oriental breed which we have today. Since 2007, a group of Havana breeders has extracted the best genes from the existing bloodlines in Britain. With like-to-like matings and the inclusion of a European Havana Brown, which originated from the British bloodlines, the Suffolk Chocolate was born. The Suffolk Chocolate achieved new breed status with the GCCF in 2014, and reached preliminary status in 2016. Suffolks have sleek, shiny coats, which are only available in chocolate and the recessive colour, lilac. These medium-sized cats have graceful, muscular bodies, long, slightly tapered tails, and elegant, long legs. Their ears are quite large and wide, and their medium-sized eyes are always green. As with all breeds, healthy kittens should have clean eyes, bottoms, and ears, and should be lively and playful. Always make sure you can see the kittens with their mum, and, if possible, their father. Visit www.gccfcats.org/Cat-Breeds/Suffolk to find a GCCF-registered Suffolk breeder. Their coats are low shedding, single in texture, and very easy to look after, as they only require a weekly brush. Linda recommends grooming with a rubber-bristled brush — you can even give them a polish with a silk scarf to keep them looking their shiny best, a treat they really enjoy! The Suffolk Chocolate is a robust breed, and to date has shown no inherent diseases. As the gene pool originates mainly from the Oriental, it is possible these cats may be prone to certain conditions, such as flat-chested kitten syndrome and progressive retinal atrophy (PRA). Is this the cat for you? If you’re out for long periods of time, Suffolks will get lonely, so it’s best to give them a stimulating environment, or another cat with whom to play.